The need for novel antimicrobial techniques has become critical for a number of reasons, including the emergence of resistant strains because of excessive prescription and misuse of antibiotics. The mouth is colonized by a large number of microorganisms. When these microorganisms are organized as biofilms they can contribute to chronic diseases in the human population, such as dental caries, candidiasis, and periodontal disease. Hence, alternative antimicrobial approaches have risen to facilitate the treatment of these diseases. As novel therapies, photodynamic antimicrobial chemotherapy and tissue-tolerable plasma are promising methods that offer the possibility of microbial decontamination with decreased odds for the traditional side effects. Thus, the present review aims to offer an overview and future directions of these new approaches to control pathogenic oral biofilms. The increased microbial resistance against commercially available antimicrobial drugs and substances have cooperated with the search for alternative treatments for the control of pathogenic biofilms involved with diseases that affect the body, including biofilm-dependent oral diseases [1, 2]. Photodynamic antimicrobial chemotherapy (PACT) is an alternative therapy that involves the concomitant combination of photosensitizers (PS) under proper light activation, aiming to generate toxic species of oxygen resulting in microbial death, while still being safe for the mammalian cells . Following the same path, another novel therapy with a similar mechanism of action is tissue-tolerable plasma (TTP), an ionized gas produced by subjecting one or more gases to an electric field, of either constant or alternating amplitude . The advantages of PACT and TTP over other antibiotic applications are that they can be used for site-specific treatment. they provide almost instantaneous bacterial response, and there is less chance for the development of bacterial resistance and minimal side effects . It is generally assumed that oxygen and nitrogen-based radicals are the most significant contributors to the sterilizing effects of PACT and TTP . Hence, this review aims to provide an overview of (i) in vitro and in vivo studies of both PACT and TTP therapies to treat oral biofilms, and (ii) additional applications in dentistry, as well as to discuss their mechanisms of action and future directions for the field. Treatment using light and PS activated by light were mentioned in ancient times and were used to treat a wide variety of disorders or diseases . Different nomenclatures are given to this process. PACT, when there is a combination of a chemical compound and light, or simply photodynamic inactivation (PDI) or photodynamic therapy (PDT), are the most common definitions [7, 8]. PACT/PDI/PDT can be defined as the administration of a non-toxic drug or dye known as PS, either systemically, locally, or topically, to a patient with a localized lesion (including some types of cancer), followed by illumination with visible light (e.g. light-emitting diode [LED] or lasers) at a proper wavelength, which will activate the PS and produce cytotoxic species and, consequently, the breakdown of cellular microstructures, infected tissue destruction, and cell death . This approach is considered a minimally invasive procedure and can be repeated several times, with minimal chances of causing resistance due to different mechanisms of action and targets . Furthermore, PACT/PDI ideally causes limited or no damage to the host tissues . A substantial number of studies state that the photodynamic approach can also be used to kill microorganisms, and is considered a promising alternative to treating oral biofilms involved in several major oral diseases such as candidiasis [11, 12], dental caries , and periodontal disease . In recent years, PACT/PDI has been proposed as an alternative treatment for localized bacterial infections . A PACT/PDI/PDT regimen can be beneficial for the elimination of microorganisms during systematic therapies of biofilm-dependent diseases, and is able to inactivate some of the known antibiotic-resistant microbial pathogens . Therefore, this approach would be beneficial for the treatment of biofilm-dependent oral diseases, considering the high accumulation of bacteria in the oral environment and the easy access to the site of the disease. This alternative therapy is already known to be effective for some localized microbial infections, such as oral candidiasis [11, 12], chronic wounds, dental caries , periodontal disease , and treatment of endodontic lesions . The mechanism by which microbial cells die when exposed to PACT-generated reactive oxygen species (ROS) has been the subject of intense investigations. Some hypotheses are that after PS activation by light in a proper wavelength (corresponding to its absorption window), there is a transfer of energy from the activated PS and the available oxygen gives rise to the formation of highly reactive oxygen species, such as singlet oxygen and free radicals that oxidize biological substrates . Another hypothesis is that after activation, PS can initiate a photochemical type I or II reaction [18, 19]. For the type I reaction, the activated PS reacts by transferring either an electron or hydrogen to an oxygen molecule or other adjacent molecule to form an anion or cation radical, respectively [18, 19]. These radicals are likely to react with molecular oxygen, resulting in ROS production [18, 19]. Examples of ROS include superoxide anion (O2 -), hydroxyl radical (OH), hydrogen peroxide (H2O2), and singlet oxygen (1O2). The type II reaction is an energy transfer that occurs at the ground state of molecular oxygen and allows the production of singlet oxygen which is capable of reacting with cellular components, generating membrane permeability, irreversible damage, and microbial death [19, 20]. Enzymes such as superoxide dismutase, catalase, peroxidase, and a number of secondary scavengers are able to control the levels of oxidative species . In addition, critical sites of action for singlet oxygen in PACT/PDI/PDT include mitochondria, DNA, and lipid membranes . As established by the literature, radiation and chemotherapy tend to damage the DNA and lead to apoptosis via cell–cycle checkpoints, growth arrest, and p53 activation [21, 22]. Alternatively, PACT/PDI/PDT tends to act via acute stress response involving mitochondrial damage, cytochrome C release, and formation of an apoptosome caspase [21, 22]. Acute challenges can affect the expression of proteins, especially transcription factors, which regulate the transcription of specific genes causing cell deregulation followed by cell death. Another possible mechanism of action is related to transcription factors; synthesis and expression of proteins are often induced by acute challenges and bind to certain regions on the DNA, resulting in transcription of genes and, consequently, production of different proteins causing cell deregulation followed by cell death . An ideal PS should have a low level of dark toxicity (e.g. in the absence of light does not present any damage effect), absorb light in the corresponding therapeutic window, null activity related to mutagenicity/carcinogenicity, and be water soluble and easily eliminated by the body [24, 25]. PS are derived from the tetrapyrrole aromatic nucleus found in many naturally occurring pigments such as hemecholophyll and bacteriochlorophyll . Such examples are represented by porphyrins and chlorins, which were the first dyes studied . Both groups present an absorption band between 630 and 690 nm that can be activated by red light sources . Synthetic, non-naturally conjugated pyrrolic ring dyes, and a non-tetrapyrrolic (naturally occurring or synthetic dye) are represented by rose bengal/erythrosine, toluidine blue, and methylene blue dyes, respectively. Most of these dyes can be excited with wavelengths between 400 and 500 nm, corresponding to light sources in the blue region [26, 27]. Different approaches and protocols have been used to determine the concentration of PS required to have the desired antimicrobial effect, which is established by the targeted microorganisms, their growth mode (planktonic or biofilm), and PS solubility [19, 28]. In general, PS are activated by complementary wavelengths. For example, phenotiazine dyes (e.g. toluidine blue and methylene blue) are classified at the blue broadband and are correctly activated by red lights at 600-660nm that corresponds to complementary wavelenght [29,30]. On this same way, red dyes, such as rose bengal, erythrosine, Photogem/Photosan can be irrdiated with wavelenghts between 400-500 nm that corresponds to the blue light spectrum [31,32]. The literature presents three main categories of clinical PACT light sources: LEDs, lasers, and halogen lamps [33•]. Lasers demonstrate some advantages, such as monochromaticity, high efficiency of light delivery without substantial power loss, and coupling of single optical fibers, but their costs are usually high when compared with other light sources [33•]. On the other hand, LEDs are most suitable for PACT and are easier to use presenting low costs when compared with lasers . Also, in terms of wavelengths, LEDs and halogen lamps are not as specific as lasers, therefore LEDs can be used for several PS with similar activation peaks . Hence, the use of halogen lamps and blue LEDs that present lower potencies and lower tissue penetration are desired. In the dental field, the usual PACT applications are related to accessible areas where light does not need to penetrate very deep (such as complementary to caries removal, caries prevention, herpes simplex, candidiasis, and periodontal disease) . Although the current studies report on the success of the use of the aforementioned PS/lights, further studies are necessary to gain a better understanding of PACT mechanisms of action and toxicity. 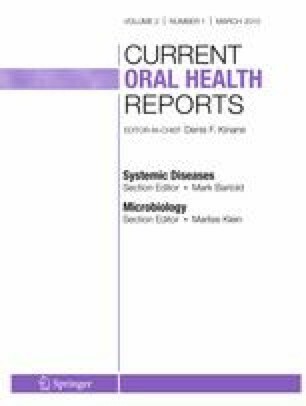 The oral cavity sustains more than 700 species of microorganisms, few of which participate in the pathogenesis of various oral diseases, such as dental caries and candidiasis [35, 36]. The main challenge regarding the treatment of these diseases resides in antimicrobial resistance, reoccurrence (treatment fail), interactions with other medical regimens, organ toxicity, staining potential, taste alteration, and compliance of the patients to achieve therapy success . The efficacy of PACT for different pathogens is dependent on the type and concentration of the PS, as well as on the interaction of the PS with the light source [33•]. In the biofilm, the presence of an extracellular matrix allows stability and structural integrity, possibly limiting the diffusion of substances throughout the biofilm, and protecting the bacteria from inimical influences of antimicrobials and other environmental challenges . Recent studies related to PACT application over Candida albicans  and Streptococcus mutans  using methylene blue/red LED (630 nm) and erythrosine/laser (532 nm), respectively, achieved a high photokilling rate. Dovigo et al. reported the inactivation of Candida sp. biofilms formed by clinical isolate strains after the biofilms were exposed to Photodithazine®. Nastri et al. state that the association of toluidine blue and diode laser light at 830 nm was effective against bacterial strains involved in periodontal disease, even though they were organized in biofilms, indicating it can be a coadjuvant method for the treatment of periodontal pockets. Araujo et al. reported that curcumin in association with blue light was effective on the decontamination of dentine carious lesions contaminated with S. mutans and Lactobacillus spp. biofilms. However, possibly because of the limitation of light penetration and drug diffusion, microorganisms were less affected in the biofilm phase than the planktonic counterparts (references). Moreover, Lee et al. were able to achieve significant cell death using erythrosine as a photosensitizing agent and a dental halogen light on S. mutans biofilm. Nevertheless, for dental use, several aspects, including energy, light irradiation times, and distance to the targeted area, must be carefully analyzed, aiming at tissue-tolerable temperature in the dentin, pulp, and other oral tissues. Plasma is an electrical discharge produced by subjecting one or more gases to an electrical field, either as a constant or alternating amplitude . The term ‘plasma’ comes from Greek language and was introduced by Irving Lanmuir, an American chemist and physicist, in 1928. There are three main states of matter—solid, liquid, and gas. When a gas receives more energy, particles of the gas collide with each other. As a result, electrons and ions are produced and the gas becomes charged. This state of matter is called ‘plasma’, which is known as the fourth state of matter . Plasma has several appealing features, including the ability to reach the gas phase without the need for elevated temperature [45, 46]. The electrons then collide with the gas, and enhance the level of dissociation, excitation, and ionization. The ions and neutrons continue reasonably cold, therefore TTP does not cause thermal damage to the surfaces [47, 48]. Bare hands may touch a TTP device without causing any heating, electrical shock, or other painful sensation . Although TTP is not as well established as PACT, these characteristics open up the possibility of using plasmas for the treatment of heat-sensitive materials, including biological matter such as cells and tissues. Plasma-based dental applications have attracted much attention in dental biomaterial modification [50, 51], tooth whitening [52, 53], dental material adhesion , and dental caries , and as an effective anti-oral biofilm agent [56, 57]. TTP may improve disinfection performance because this approach can kill several microorganisms, including bacteria and viruses [55, 58, 59, 60, 61, 62, 63]. Scanning electron microscopy (SEM) was used to study how TTP exposure can impact Escherichia coli cell morphology . The results show that E. coli cells presented severe morphological changes, including lysis (splitting of cells), which was attributed to one of two processes: membrane rupture caused by the charge build-up on the cells, or chemical attack by radicals such as O2 - and/or OH. Microorganisms exposed to plasma are also exposed to an intense bombardment by these short-living reactive species, with a higher oxidation potential, probably provoking surface levels that the living cell cannot repair sufficiently quickly. In this sense, we can say that TTP destroys microorganisms by disrupting the cell wall using these highly reactive free radicals, without the use of heat, chemicals, or pressure . This may explain why cells are, in many cases, destroyed very quickly . Sterilization by TTP usually depends on the synergism of a few bacterial agents: energetic photons in the ultraviolet (UV) B and UVC range; reactive species, including oxygen free radicals; and charged species such as electrons and ions. Their relevance is dependent on the type of plasma source and the sample preparation, in addition to how the UV photons get absorbed in atmospheric air . The main plasma sterilization mechanisms are etching, oxidation, and UV radiation. Thus, bacterial size and structure may affect plasma effectiveness in bacterial deactivation. Yang et al. reported the bactericidal effect of TTP on S. mutans and L. acidophilus, which are major pathogens in dental caries. The results indicated that TTP treatment was very effective in the disinfection of oral bacteria. They found that L. acidophilus killing needed a longer TTP exposure when compared with S. mutans. One of the hypotheses is that L. acidophilus presents a larger cell (≅1 μm × 3 μm), which could mean higher plasma tolerance when compared with the smaller S. mutans(≅1 μm in diameter) . To accomplish the same killing intensity, up to 5 min of TTP exposure was necessary to deactivate L. acidophilus, which is contrary to the 10 s of TTP exposure needed to kill S. mutans. In the same study , free-floating planktonic S. mutans and L. acidophilus were exposed to argon plasma for different periods of time. Leakage of intracellular proteins and nucleic acid related to bacterial killing were accessed by a UV-visible spectrometer. The absorbance peak intensity was the highest amount of intracellular proteins and DNAs. According to the findings, a very short plasma exposure of only 1 s significantly increased the killing of both bacteria, which was demonstrated by the dramatic leakage of the intracellular proteins and DNAs, which usually occurs when the cell membranes are damaged. Lu et al. showed that TTP could efficiently kill Enterococcus faecalis grown in biofilms, one of the main types of bacterium causing failure of root canal treatment, in several minutes. Pan et al. also investigated the in vitro feasibility of using cold plasma against E. faecalis in infected root canals, and observed a significant decrease in the number of colony-forming units, after a prolonged exposure time of 8–10 min. Yamazaki et al. [70•] carried out experiments to evaluate the sterilizing effects of the low-frequency atmospheric pressure plasma on oral pathogenic microorganisms (S. mutans, C. albicans and E. faecalis) and to determine its potential for clinical application. The major findings were that the plasma was effective in sterilizing all three oral pathogenic microorganisms in a short exposure time. Furthermore, the highest concentration of plasma energy occurs 5–6 mm beyond the plasma needle . The plasma needle produces bactericidal agents locally and no excess of radicals remained at the end of the treatment period . Sladek et al. evaluated the antimicrobial activity of TTP against biofilm cultures of a key cariogenic bacterium, S. mutans, comparing TTP with 0.12 % chlorhexidine mouth rinse. The authors suggested that TTP may benefit caries treatment not only because of its antimicrobial properties but also because TTP is a gas that acts in a non-contact way, which could implicate that it can diffuse toward the surface, allowing the treatment of surface irregularities, including cracks and fissures. Under the conditions of this study, TTP presented higher inhibitory effects against S. mutans biofilm when compared with 0.12 % chlorhexidine. Moreover, the effectiveness of TTP is also dependent on the type of bacteria, culture medium, and input power of plasma. Furthermore, considering dental material adhesion is one of the main concerns in dentistry, TTP has also been used to modify the surface of polymers and to deposit an inert protective layer on it (reference). The plasma processes can increase wettability, biocompatibility, and durability without influencing bulk material properties (reference). This feature of plasma may have great potential for dental application [72••]. Recently, there has been increasing interests on the effects of TTP. Since TTP has a bactericidal effect on oral pathogens, although it could not replace rotary instruments, it is expected that TTP will play an important role in the prevention and treatment of dental caries. Likewise, TTP is a potential method for disinfection of root canals and for the treatment of other infectious diseases of the oral cavity. There have been attempts to apply plasma technology in the various fields of dentistry. Although many studies are still in the early stages, the potential value of plasma for dental applications has been demonstrated [44, 57, 60]. In addition to safety concerns, the fundamental principles of how TTP interferes with tissues, cells, and the entire living body must be investigated. To enlarge the scope of plasma applications and place relevant research to practical use, interdisciplinary research with participation of dental professionals is required. Although both PACT and TTP therapies are very promising, they are still not ready to replace classic therapy for treatment of oral diseases. However, these alternative approaches may improve, accelerate, and lower the cost of prevention and treatment of these diseases. Further studies should take into account aspects such as concentration of dye and high-potency light sources (important factors to be considered for PACT), as well as optimizing the exposure time and substance used to generate the TTP stream to further facilitate the elimination of oral biofilm bacteria. Dr. Marco Aurelio Paschoal declares no potential conflicts of interest relevant to this article. He has received a grant and support for research development from Fundação de Amparo à Pesquisa e ao Desenvolvimento Científico e Tecnológico do Estado do Maranhão (FAPEMA). Dr. Thereza Dantas declares no potential conflicts of interest relevant to this article. She has received a grant and support from Coordenação de Aperfeiçoamento de Pessoal de Nível Superior (CAPES) for research development. Dr. Simone Duarte declares no potential conflicts of interest relevant to this article. She has received a grant from the International Association for Dental Research (IADR).